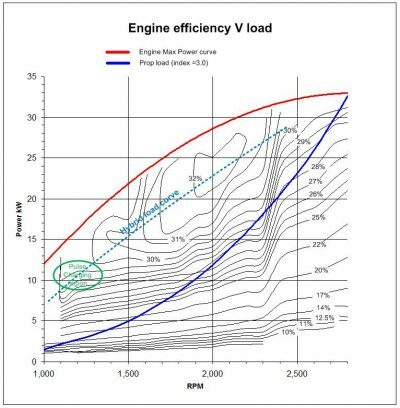 Two noteworthy recent offerings at the high-power and low-power ends of vessel propulsion ranges come from Diesel Center in Italy and Hybrid Marine in the U.K. Both use twin electric “machines.” Diesel Center operates on a twin propeller shaft system, and Hybrid Marine operates on the same propeller shaft. The Diesel Center system has been implemented on the San Lorenzo SL 106, seen in operation in the video above. The 115-ton motoryacht is 106’ (32m) in length with twin MTU 2,400 hp diesels. A 180 hp electric machine (developed by Diesel Center) has been added to each propeller shaft, operating in parallel with the MTU diesels. In spite of the massive disparity in the rated power of the diesel engines and electric machines, it has been possible to design these to deliver the same torque to the propeller shafts—up to a diesel speed of 1,000 rpm (this is thanks to the inherently high torque of permanent magnet electric motors). As a result, the electric machines can drive this 106’ vessel at up to 10 knots. When in diesel engine mode, the electric machines can either be used to boost the diesel engines for faster acceleration or else can be driven as powerful generators. 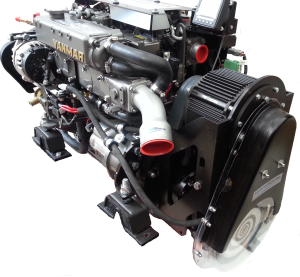 A Yanmar 70 with twin motor multi-mode hybrid. Hybrid Marine’s multi-mode hybrid is designed to adapt its working mode to achieve maximum efficiency over a wide range of operating conditions. The electric motors are capable of handling all low-speed propulsion until the battery pack is depleted. This eliminates the most inefficient range of diesel engine operation at the same time as it delivers a remarkably quiet ride (another of the key goals of the system). At 9 knots the range in calm waters is around 10 miles. Once the battery pack is depleted, either the generators kick in, or one of the diesel engines can be cranked driving its electric machine as a generator, which powers the other electric machine. The combined propulsion load and electric machine load on the operating diesel engine is sufficient to drive it into a relatively efficient part of its fuel map, resulting in substantial overall fuel savings as compared to the conventional practice of running both diesel engines at light propulsion loads. The Hybrid Marine system is particularly intriguing in as much as it offers both serial and parallel operation in a single package. Two electric machines are connected to a propeller shaft, which is also connected to a diesel engine. A patent-pending “powersplit” arrangement of clutches and gears enables either or both of the electric machines to drive or be driven by the propeller shaft in a parallel hybrid configuration. Or it can enable one electric machine to be driven as a generator by the diesel engine providing power to the other machine, which now drives the propeller in a diesel-electric serial configuration (and which can also be used to bypass the transmission in the event of a transmission failure). The engine can be used in stand-alone mode, or can drive both electric machines as generators. The electric machines can also be used as a back-up starter motor. When the system is installed on a sailboat, the electric machines can be driven in regeneration mode (i.e., using sailpower to create electricity). Graeme Hawksley, the designer, has defined a conceptually somewhat overwhelming 30 different potential modes of operation! See www.hybridmarine.co.uk for further information. For further reading see “We Can Have Hybrids” in Professional BoatBuilder No. 164. About the Author: A contributing editor of Professional BoatBuilder, Nigel Calder is the author of Boatowner’s Mechanical and Electrical Manual and other marine titles (including, earlier in his career, Marine Diesel Engines), and is a member of the American Boat & Yacht Council’s Electrical Project Technical Committee.